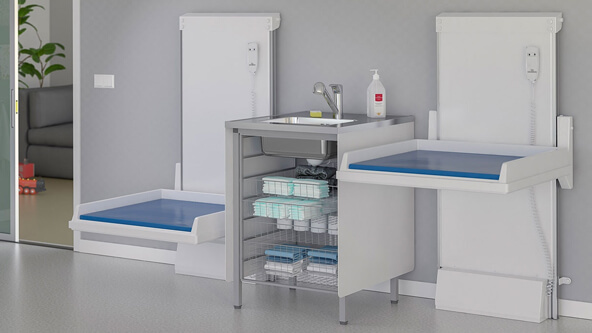 Granberg's range of baby changing tables are ideal for those looking to create a premium height adjustable setup in the home or workplace. The sleek designs are twinned with quiet electric motors, resulting in stable and stylish solutions ideal for hospitals and nurseries as well as domestic properties. We provide both wall mounted and freestanding options, as well as fixed height versions for those looking for a simple space-saving changing area. In addition, several of these tables can be upgraded with access ladders and basket storage to create a fully equipped changing station.